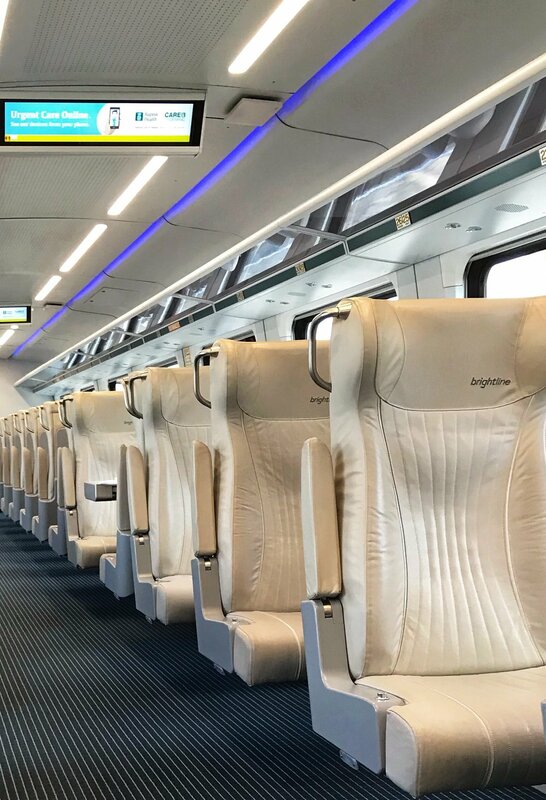 Then we hoped on a Brightline from Fort Lauderdale to Miami on Wednesday of this week and I had a transportation epiphany. Now one of my brothers had recommended it pretty enthusiastically last year, nonetheless I was still ill prepared for what awaited me at both station stops and onboard the actual diesel-electric express. If you’ve only ever taken Amtrak, be prepared to practically cry tears of JOY and find yourself throughout the day going back to your Brightline trip, gushing about how much you loved it - either to your traveling companion or to your fellow shoppers (and gawkers) at day 1 of the buzzy Glossier Pop Up in Winwood. Their smart stations are like a dream. Shiny and modern. (And yes BRIGHT!) Once inside the automatic glass doors, and past the rental scooters set up out front, there are pleasant people waiting to direct you thru the entry process and answer any questions. Also to assist with checking any luggage or larger bags you might have in tow. Next it’s on to security. 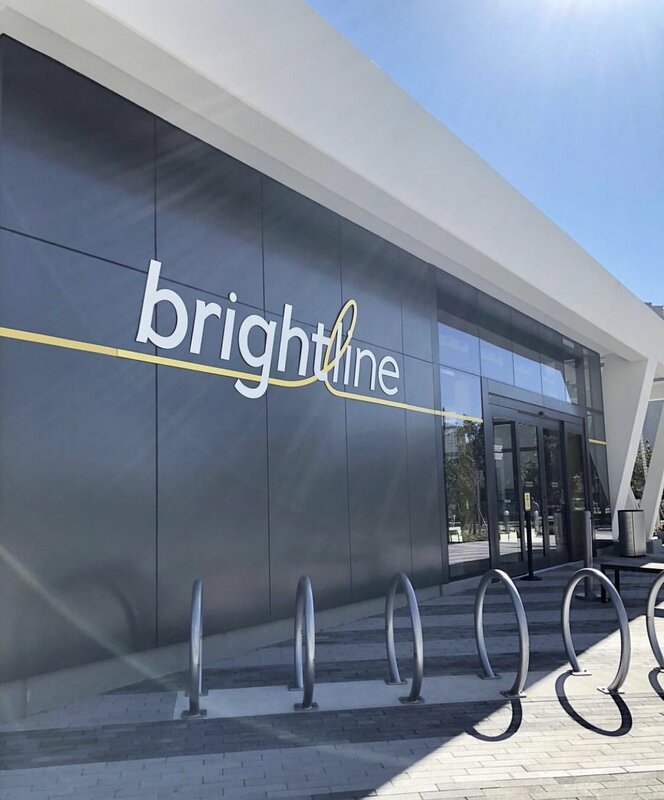 Now I’ve often wondered why there’s nothing like this with Amtrak, but similar to the whole airport boarding process, our friends at Brightline have a scanner for carry on bags - just after the turnstile area where you scan your digital tickets - with two more attendants. After passing thru that (it takes only a few minutes) you enter the lounge areas, and what a stunning space that is! Their lounge areas are cheery, light-filled oases with comfy seats, free wifi and charging stations (Those of us who frequently find ourselves at 11% with the terror of nowhere to plug in a traditional charger will really appreciate this feature. ), and an adjacent stand where you can purchase a wide variety of hot and cold beverages, snacks, magazines, and extras like umbrellas for those sudden FLA downpours. Their new-ish Select Lounges might have you channeling Vince Vaughn’s character in the movie Made when he scores a tix in first class for the first time. Same seating and smart phone related amenities as above and so much more, including FREE self serve illy Coffee and fruit infused water, complimentary breakfast foods like baked goods or yogurt parfaits thru 11am, and beverage stations with champs, wine, and beer. Not to mention newspapers and mags, large screen tv’s, and a work area supplied with Brightline sticky notes, pens, and a wireless printer. In addition, when we arrived at the Select Lounge in Miami yesterday afternoon prior to our 5:09pm return train, we happened upon a Mediterrean spread that looked like something your bestie who loves to entertain would have ready and waiting at her house on wine night - olives, cheeses, Carr brand crackers, the works. Once onboard, we had assigned seats, something civilized that I also adore about flying Jet Blue. In the Select Car, we made our way down the aisle - through a sea of plush leather reclining seats - and were greeted with cold hand towels, beverage and snack service (The woman across from us ordered a Prosecco. We had waters. ), and 2 choices of bento boxes. 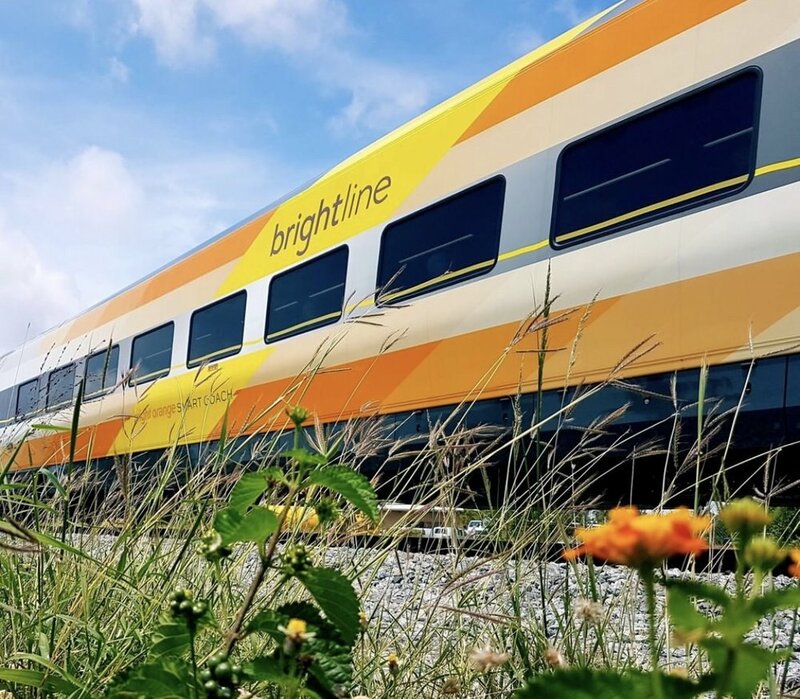 Brightline service runs between Fort Lauderdale, Miami, and West Palm. (Once you arrive at your destination, there are designated LYFT pick up and drop off areas too, another big plus in terms of getting around.) After merging with Richard Branson’s Virgin Group last fall, a name change to Virgin Trains USA is on the horizon, but all the more reason (Anyone who’s ever flown Virgin Atlantic Airways - particularly their business or first class - will probably attest to this.) to find an excuse next time you’re in the area (April vacay, for ex.) to try it for yourself. Highly recommending, and I wish there was something like it in the Rhode Island area. I mean, can you imagine the convenience and comfort of trips back and forth to Boston and NYC?